Last October we ran a global survey through iKMS to find out how much organisations invest in their KM initiatives – in terms of the senior management attention and support they get, whether they invest in building the qualifications and experience of their KM staff, and whether they consciously protect the KM experience they are building by providing career paths for their knowledge managers. The results overall are extremely depressing, and the “new kids” on the block in Asia apparently do far better than the supposedly more mature environments of North America, Europe and even Australasia. Here’s a table summarising the key findings (click on the image for a larger version). Green boxes indicate the better performers and pink boxes indicate the worse performers. The full results can be downloaded here. And here’s a video presentation from iKMS’s KM Singapore conference, where I presented the findings for Singapore compared with the rest of the world. The MPEG4 video file can be downloaded here. [NOTE TO PC USERS: the filename appears to be too long for PC-version of Quicktime to handle. Just abbreviate the filename once you’ve downloaded it, and it will play just fine]. My thanks to the members of various KM communities and contributors, including iKMS, HKKMS, HKPolyU, actKM, SIKM Leaders Forum, KM Malaysia, KMTalk, KM Forum, the Gurteen Knowledge Community, as well as readers of this blog, for participating in this exercise. Thank you for sharing this very interesting dataset. Australia did not fare well, but I am not surprised. I think a lot of the problem is an inability to define the discipline in terms senior managers can understand. Further it is hard to gather data and measure success, which is one of the reasons I am moving down the network analysis path. Another reason may be the tendency to outsourcing, which produces transient results. You may care to blog about outsourcing corporate memory - I recall we chatted about this two years ago, and Dr Vaine had something to say about it! 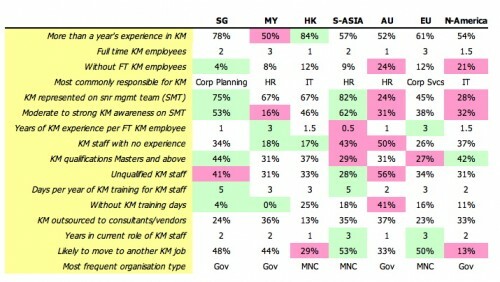 Thanks Graham - to be more accurate, the survey suggests there is an inability to define KM in terms that Australian/Malaysian/American managers can understand. I was surprised by the degree of diversity and the poor showing of the more “advanced” economies. I wasn’t sure exactly of the role that outsourcing plays - whether it’s positive or negative… There does seem to be a link in the regions/countries that outsource a lot of their KM and also fare badly overall. But I also think it’s an important way of importing expertise and competencies into an organisation, so long as there is a mechanism and process for internalising and retaining it. If I remember correctly, you were the one who invented “memory outsourcing” so why don’t you blog first and get the ball rolling ? Patrick I don’t dispute the finer interpretation you put on these data - you’re closer to these data and I’m still looking at the detail. I think some of the problem may be cultural. The more “advanced” economies are probably more inclined to seek the silver bullet and want instant gratification - certainly that’s my experience in the public sector in Australia, hence my earlier transient comment. My limited experience of Asian cultures suggests they have more patience. Malaysia may be an abberation in your dataset? I will blog about “outsourcing corporate memory” in the next few days. May I use some of your data? thank you Patrick for sharing this interesting findings. I wonder if this is the sinario at top level what will be understanding at middle and lower level. I think further study should be done that is there any diffrence across diffrent industry sector. One study which I undertook in India shows there is skewed result in favour of IT companies other industries had not yet picked up in their KM efforts in India. Thanks Parag, yes, I’ve had a couple of emails suggesting that an industry slicing might also be useful. I’m happy for this instrument to be extended by other people, if the data can be shared and consolidated! The questions are included in the master data table attached to the post.